There are two types of Akitas, the original Japanese Akita breed and now a separate designation for American standard Akitas. The weights and sizes are different and the American standard allows for a black mask, whereas the original Japanese breed standard does not allow a black mask. According to the FCI, in Japan and in many other countries around the world the American Akita is considered a separate breed from the Akita Inu (Japanese Akita). In the United States and Canada, both the American Akita and the Akita Inu are considered a single breed with differences in type rather than two separate breeds. The largest of the Japanese Spitz-type breeds, the Akita, pronounced a-KEE-ta, is a powerful, solid, well-proportioned and distinctive looking dog. Strong and muscular with a flat, heavy head and strong, short muzzle, the Akita has a deep, broad chest and a level back. The dog is slightly longer than he is tall. The head is triangular shaped, broad and blunt. The stop, which is the transition area from the backskull to the muzzle, is well-defined. A shallow furrow extends well up the forehead. The ears are small and erect, carried forward and in line with the neck. The dark brown eyes are small and triangular in shape. The nose is broad and black. 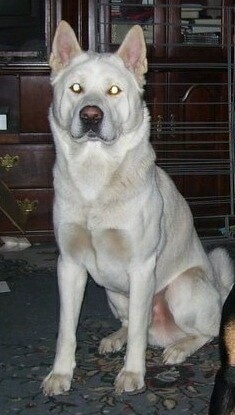 Brown is permitted on white Akitas, but black is preferred. The lips are black and the tongue is pink. The teeth are strong and should meet in a scissors or level bite (scissors is preferred by most breeders). The tail is plush and carried over the dog's back. The webbed feet are cat-like. The Akita is double coated. The outer coat is harsh and waterproof. The undercoat is thick and soft, providing nice insulation for the dog in cold weather. Coat colors are pure white, red, sesame, brindle and fawn. The colors should be without clear borders. A black mask is forbidden. The Akita is docile, intelligent, courageous and fearless. Careful and very affectionate with its family. Sometimes spontaneous, it needs a firm, confident, consistent pack leader. Without it the dog will be very willful and may become very aggressive toward other dogs and animals. It needs firm training as a puppy. The objective in training this dog is to achieve a pack leader status. It is a natural instinct for a dog to have an order in their pack. When we humans live with dogs, we become their pack. The entire pack cooperates under a single leader. Lines are clearly defined. You and all other humans MUST be higher up in the order than the dog. That is the only way your relationship can be a success. If the dog is allowed to believe he is the leader over the humans he may become very food-possessive as he tells the humans to wait their turn. He eats first. The Akita Inu is a first-class guard dog. Japanese mothers would often leave their children in the family Akita's care. They are extremely faithful and thrive on firm leadership from their handlers. It should definitely be supervised with other household pets and children. 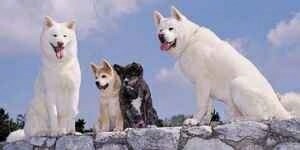 Although the breed may tolerate and be good with children from his own family, if you do not teach this dog he is below all humans in the pack order he may not accept other children and if teased, Akita's may bite. Children must be taught to display leadership qualities and at the same time respec the dog. With the right type of owner, the proper amount of daily mental and physical exercise and firm training, they can make a fine pet. Obedience training requires patience, as these dogs tend to get bored quickly. 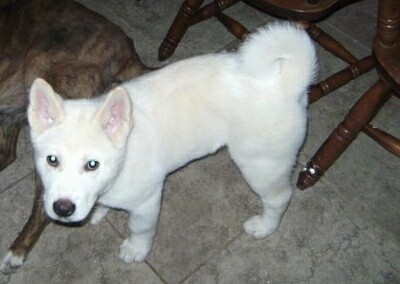 The Akita Inu needs to be with its family. It vocalizes with many interesting sounds, but it is not an excessive barker. 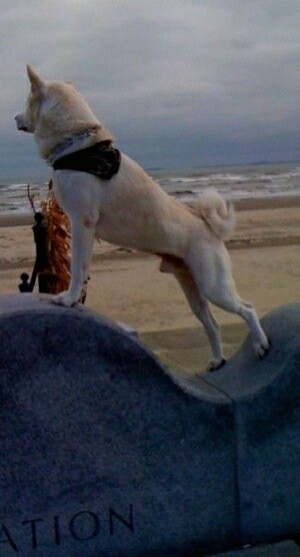 The Akita Inu will do okay in an apartment if it is sufficiently exercised. It is moderately active indoors and will do best with a large yard. The Akita Inu needs moderate but regular exercise to stay in shape. It should be taken for long daily walks. The coarse, stiff, shorthaired coat needs significant grooming. Brush with a firm bristle brush, and bathe only when absolutely necessary as bathing removes the natural waterproofing of the coat. This breed sheds heavily twice a year. There are two types of Akitas, the original Japanese Akita breed and now a separate designation for American standard Akitas. The weights and sizes are different and the American standard allows for a black mask, whereas the original Japanese breed standard does not allow a black mask. According to the FCI, in Japan and in many other countries around the world the American Akita is considered a separate breed from the Akita Inu (Japanese Akita). 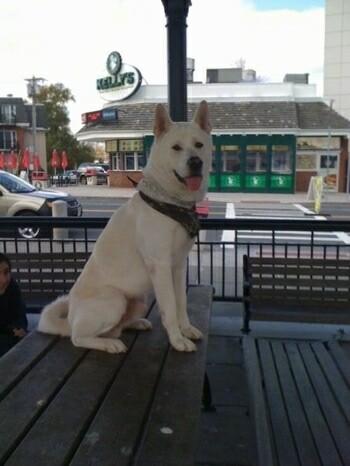 In the United States and Canada, both the American Akita and the Akita Inu are considered a single breed with differences in type rather than two separate breeds. 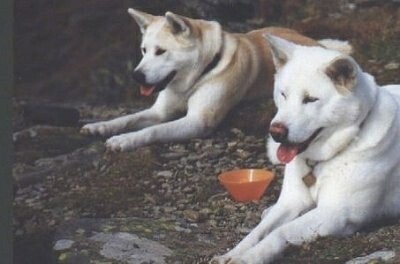 The Japanese Akita is uncommon in most countries. 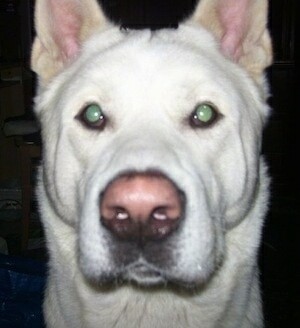 "This is my purebred Japanese Akita named Boston (he is not an American Akita). He is all white with a little bit of cream thrown in." Boston the purebred Japanese Akita at 2 years old—"He loves to take walks down the beach and stare at the water and chase the waves. He is an amazing dog and he weighs 88 pounds now. He means the world to me."